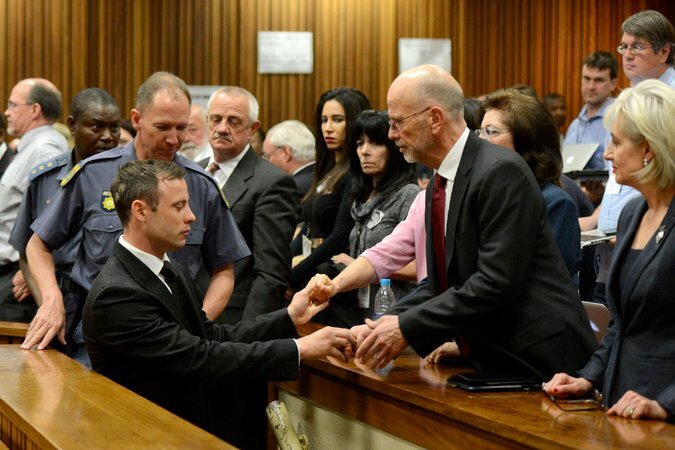 Oscar Pistorius held the hands of family members after being sentenced to five years in prison on Tuesday. With a judge seeking to strike a balance between mercy and retribution, Oscar Pistorius, the South African track star, was sentenced Tuesday to five years in prison for killing his girlfriend, Reeva Steenkamp. The athlete’s defense team said the law under which he was punished calls for him to serve only one-sixth of the prison term — 10 months — before he can be placed on house arrest. He was also given a suspended three-year term on separate firearms charges. This doesn't sound like a case of him getting away with something because of some love of guns. Rather, it sounds like a situation where the modern desire to get away from "punishing" crime has run amok. Nobody said he got away with it BECAUSE of his love of guns. Gee, that includes me--I didn't suggest you said it was because of His love of guns. You've repeatedly implied that it was because of some cultural affinity for them that led to him not having the hammer swung at him. But sure, don't discuss the issue--act like I said something stupid so that you can dismiss me. "This doesn't sound like a case of him getting away with something because of some love of guns. " You did say something stupid - and then denied it, naturally. Wow, keep harping on that and showing your inability to comprehend what you read--even after the meaning has been explained to you. "Ownership of a firearm is conditional on a competency test and several other factors, including background checking of the applicant, inspection of an owner's premises, and licensing of the weapon by the police introduced in July 2004. The process is currently undergoing review, as the police are at present, not able to adequately or within reasonable time, process either competency certification, new licenses or renewal of existing licenses." "It is possible that the law has led to a situation where over a million South Africans are now liable for arrest and prison sentences of up to 15 years – an untenable situation." House arrest is not uncommon in in the US. In fact, there was a recent well publicized conviction for criminal vehicular homicide case that included supervised release. Maybe Pistorius got his gun permits the same way some celebrities do in The States. But what do you think of the sentence? "But what do you think of the sentence?" It is what it is. I don't know what the norm is for negligent homicide is in South Africa. It seems to have a real violent crime problem with a homicide rate of 34/100k in 2009. I think it was light. Too bad we can't take the Pistorius sentence and average it out with the Dunn one. You want to see Dunn out someday? Why? Theodore Wafer got too long of a sentence, but I don’t think Dunn did. I can see the difference between Wafer and Dunne, but in my opinion they both received excessive sentences. Oscar made out like a bandit, on the other hand. Looks like the prosecutors are going to try for a do-over. At first glance, this would appear to be double jeopardy to me. Can any of our legal scholars weigh in to clear this up for me?
" Prosecutors said Monday they will file appeal papers in the next few days against the verdict and sentencing in the case of Oscar Pistorius, who was given a five-year prison term after being convicted of culpable homicide for killing his girlfriend." I think I heard there is no double-jeopardy rule in SA. "I think I heard there is no double-jeopardy rule in SA." I looked it up here and this source matches what you said. However, there seem to be a lot of exceptions in various countries. Where the various governments take advantage of, dare I say it, loopholes. The above is not considered a violation of the constitution. Because of Supreme Court precedent, this process is all considered part of a single proceeding." That is why I was confused in regards to South Africa. The only exception I know of in the US is that a person can be tried under the Uniform Code of Military Justice after an acquittal in a civilian court.